Woods is playing well enough to win. Even so, this is one time Woods will consider it a very good year even if he doesn’t. Tigermania first struck in 1997 with his watershed victory at the Masters. It hit again during a stretch from 1999 through 2001. Now it’s back at full tilt for a guy who hasn’t won in more than five years. Tiger Woods seems to be bigger now than when he was good. Not that he’s all that bad. Remember, it was just seven months ago that Woods began his year not knowing how his game would respond to four back surgeries that limited him to 19 starts on the PGA Tour and kept him out of the FedEx Cup playoffs since 2013. Not only did he make it to the PGA Tour’s version of a postseason, he starts The Northern Trust at No. 20 out of the 125 players who qualified. He is playing well enough to win. Even so, this is one time Woods will consider it a very good year even if he doesn’t. And that might explain the reaction to him. It’s not just the headlines he makes for finishing 12th or the shot-by-shot TV coverage at every tournament. It’s the response outside the ropes that keeps getting bigger and louder, week after week, from Palm Harbor to Potomac, from the British Open to Bellerive. Stewart Cink described the third round at the PGA Championship as “a pretty intense environment” playing with Woods, this from a man who played with him (and often lost to him) during a time when Woods looked close to unbeatable. 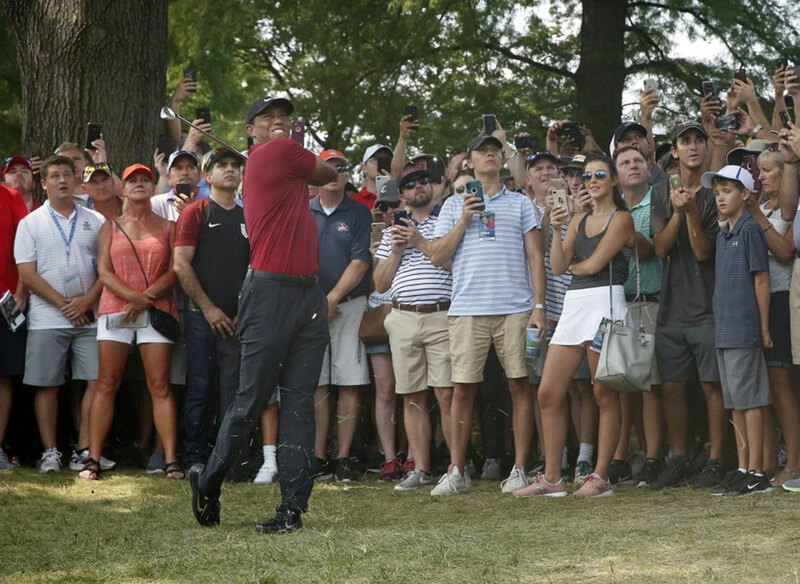 “I think everyone at the golf course cheers for him,” Brooks Koepka said after winning the PGA Championship at Bellerive while hearing one ear-splitting cheer after another for Woods on the back nine. Tigermania first struck in 1997 with his watershed victory at the Masters. It hit again during a stretch from 1999 through 2001, when Woods won five of six major championships and 19 out of 38 events on the PGA Tour. And now it’s back at full tilt for a guy who hasn’t won in more than five years. Some of that is because fans thought they might not ever see him play again. And some of that could be from those who wonder how much longer he’ll be around. The Northern Trust is the five-year anniversary of Woods first showing undeniable evidence of back problems, dropping to his knees with spasms during the final round on his way to a runner-up finish. He had back surgery in the spring of 2014, two more in the fall of 2015 that kept him out of golf for more than a year and then fusion surgery on his lower spine — “the last-ditch effort,” he called it — in April 2017 that kept him off the PGA Tour another season. In the midst of that, there was his woeful mug shot from a Florida jail after his Memorial Day arrest on a DUI charge from a bad mix of painkillers. It was a low point, especially the arrest video. It had the look of being the end of his career. That seems a distant memory now. Woods delivered the largest crowd Tampa had ever seen for a golf tournament when he finished one shot behind at the Valspar Championship. He had Carnoustie buzzing when he had the lead for two holes during the final round of the British Open. He shot 64 in the final round at Bellerive, his lowest final round in a major and his best finish in nine years. He probably won’t hear noise like that the rest of the year, except maybe at the Ryder Cup. Woods was appointed a vice captain for the Ryder Cup in February and talked about wanting to make the team. He was No. 106 in the standings. Twelve tournaments later, he finished 11th and is certain to be a captain’s pick. It’s been a different kind of year, for sure. Woods can hear it. And he likes it. Fans can relate to him more, even though he hasn’t won. Maybe it’s because he’s not winning all the time that they can relate to him more as a player instead of a machine. Woods has used the word “blessed” just about every week. He is playing again, when a year ago he had not even been cleared to swing a club. And it doesn’t hurt to get treated like a rock star everywhere he goes. It’s one thing to be looked upon with awe. That comes from winning, from the kind of dominance golf had never seen. It’s another thing to feel the love.